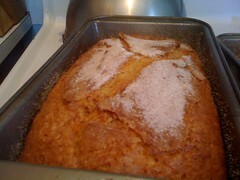 AmishCinnamonFriendshipYogurt Bread. As if it needs another descriptive: this loaf is a chain letter. I played rugby for a total of 11 years, then coached it for five. Prior to getting invited to join the team in college, I was at best a less-than-mediocre ball sport player. My hand-eye coordination was terrible as a kid: softballs in flight were appreciated by me as only instruments for damaging my face. I made the 9th grade basketball team, but my efforts to keep a ball in bounds with my foot dismayed the coach. I played community league soccer, but as I’d only started at age 13 or so, I didn’t have the skills to even make the first cut on my high school team. And that was AFTER I spent a week at soccer camp. Only at about age 14, which oddly enough was when I took my brother’s lead and started taking drum lessons, did I gain any sort of facility with catching objects. To this day, I still attribute this sudden gift with the fact that I learned drums on a full kit – which means that I had each of my limbs doing something different, most of the time. Within 3 years I was able to juggle three small balls in the air (nevermind that I taught myself to do so as a procrastination method, when my college essays were due). When that wily Lisa Teborek recruited me for Carleton Rugby, that first week of college, I had been thinking of doing intramural soccer. I’d had in the back of my mind that I might be willing to try a new sport, maybe even something involving balls, and BANG there it happened. For once, I was at the same skills level, as everyone else, as rugby was new to everyone. And I improved. I excelled, even (sometimes). I absolutely loved playing. Women’s rugby offers all sorts of beautiful, amazing reasons to play, but for me it was always about happiness: joy in movement. It was a very in-the-moment, can’t-stop-smiling sort of thing, for me. My own energy and skills would contribute to 80 minutes of graceful ball movement and powerful displacement of obstacles. It was a glorious feeling! This sensual logic didn’t always offer helpful guidance in difficult, high-pressure matches, but, well, maybe that’s why I only played for 11 years and stopped coaching after 5. I’m more of a hedonist than a competitor. Side note: This may explain why, I’ve recently discovered Tony Bourdain’s “No Reservations” show on DVD and I simply can’t get enough of it. So. Doing something because it makes you happy is a perfectly valid reason to do anything. Last week in my yoga teacher training, we watched the film “What Is Yoga.” One of the things I took from it was the idea that people practice yoga for happiness. In the film, there is an explanation of how yoga evolved, in one early stage of it. It developed out of simple sitting poses for meditation, into the more active, dynamic poses that we do in Vinyasa practice, and the people that introduced those asana did so in an effort to achieve happiness while practicing yoga. It’s probably a good idea to balance that with other activities that help meet other needs for one’s self and family, and to make sure that doing yoga does not hurt anyone else. But it’s really not so bad of an idea, to take 20 minutes a day (or 14+ hours a week, like I do, lately), to feel good in your own skin. That lovely loaf of bread is pictured above because baking it also made me happy. Fingers-in-dough asana is a good one. That Amish friendship starter is just a way to say: you need something more to tend every day for the rest of your life. I’ve received it, used it and discarded it countless times (makes pretty good bread, though). I became a runner because I had no co-ordination (discovered why at 40; a bit late). I still hold a record: it took me 6 minutes to shoot a lay-up with no one guarding me! I’ve always enjoyed rugby, but I never really “got” it. Heh. That Amish friendship starter sure showed me how few people (well, coworkers) are into baking. I nearly had to beg someone to take the third bag. So, I may end up assailing another group, with the next batch of goo, and give it all away. There’s too many other things I want to bake. And do. Running’s also something I’ve done, for as long as I remember, because it feels good. Thankfully, running track or doing the local 10k with Dad didn’t involve catching anything airborne.